Now that it’s February, the publication date for my debut novel is just two months away, which means it’s time to share the White Rose pre-order gifts I have planned! I’m so thankful for everyone who wants to read, so this will be my turn to give back to you. My local independent bookstore, Porter Square Books. I’ve attended more book launches at PSB than I can count, and I just love the knowledgeable, friendly staff (and the fact that the store is one of the most enthusiastic settings for the HONK! band to parade through). Any independent bookstore (I love indies!). You can find the closest one to you on Indiebound and pick it up in the store–how cool is that? Any library. I personally pick up a ton of the books I read at my local branch. Did you know that you can make a request at your local library to purchase a book? 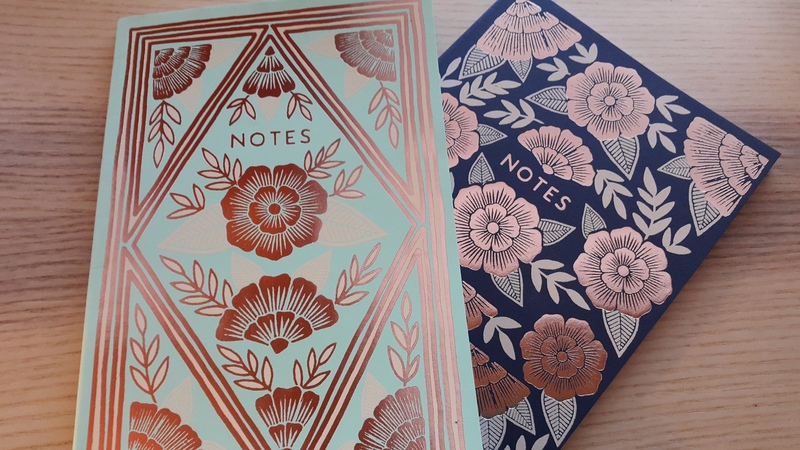 Getting my book into libraries where even more readers can find it is a huge dream of mine, so if you prefer to make a library request, that will also qualify. One of the larger outlets. I realize many people make their book purchases at Amazon or Barnes & Noble or others I haven’t listed, so these will count as well. Also, for my international friends, books can be ordered and shipped through Book Depository. To receive your gifts, send your full name, mailing address, and proof of your pre-order to WhiteRose.Preorders@gmail.com. A screenshot or photo of the pre-order or library request is fine. Now on to the gifts themselves! First off, everyone who enters will receive a beautiful bookmark and a sticker. This part of the giveaway is open internationally! I truly appreciate the support of all readers, and I’m so glad I can at least send along these goodies to readers farther afield. Then, along with these swag packs, winners of the following gifts will be chosen randomly among entrants based in the U.S. (because shipping costs). 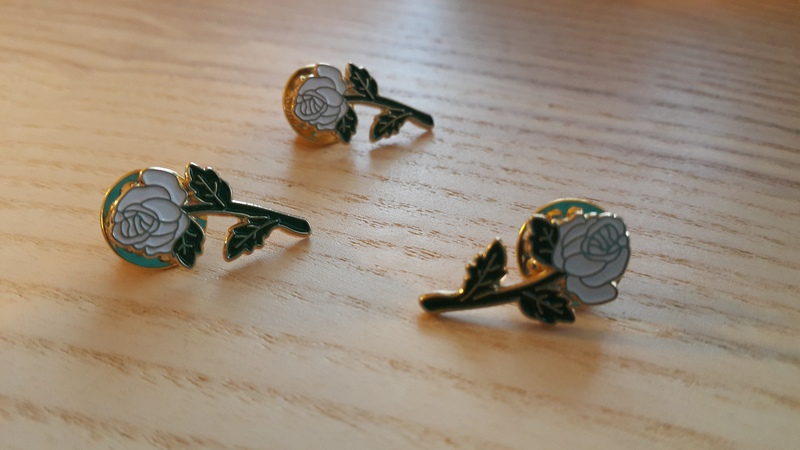 Three third-place winners will receive a white rose enamel pin in addition to the swag pack. Aren’t they beautiful? Two second-place winners will receive rose-themed notebooks in addition to the swag pack. Useful for jotting down any and all thoughts! 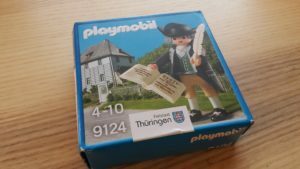 One grand-prize winner will receive a mini Playmobil figure of Johann Wolfgang von Goethe in addition to the swag pack. Goethe was an 18th-19th century German author whose words inspired the White Rose to take action, and I just loved that his action figure shows him writing. A pre-order of the hardcover or ebook of White Rose made by 11:59 pm EST on April 1, 2019 counts as one (1) entry. The giveaway is open internationally to contestants 13 years of age or older. By entering, you are stating that you are 13+ and that you authorize me (Kip Wilson) to contact you via email to confirm your address for prize pack. For each book preordered, entrant will be mailed a single swag pack including: (1) bookmark and (1) sticker. This giveaway is open to international entrants and will continue while supplies last. UPDATE!!! I am back in town after the amazing Versify bus tour, and have randomly selected the prize winners! I’ll be sending everything out tomorrow (including the bookmarks and stickers for everyone). Thank you once again for your pre-orders. Hope you all enjoy the book!